This week the first set of changes announced in the October Release Notes are available, starting with Admin Analytics, and Power Query integration. 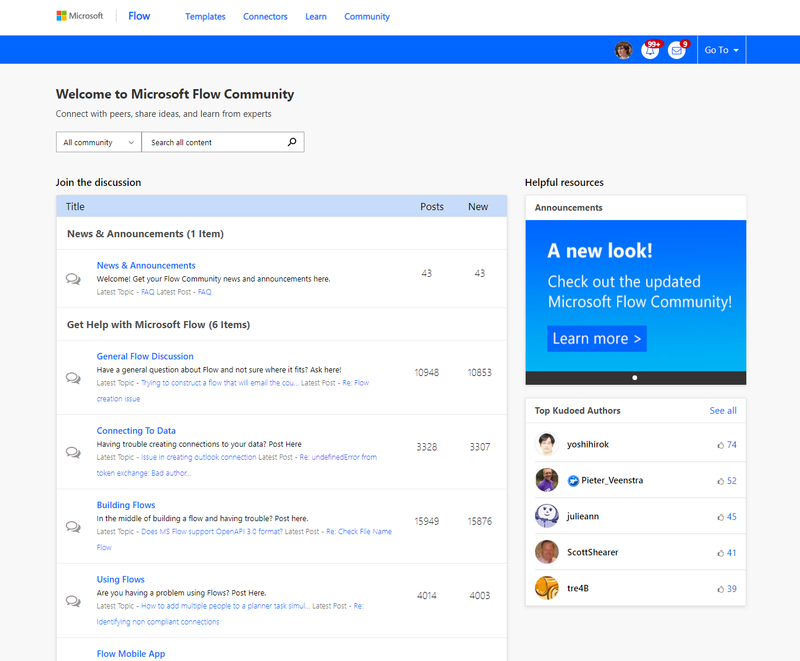 As Microsoft Flow adoption grows within the enterprise, customers have expressed a need for greater visibility into how their organization is using Microsoft Flow. Administrators can now explore analytics related to executions, usage, sharing, and error details. Read more about this new feature in this detailed blog post. In addition, this week we are releasing a new Power Query experience that will allow makers to shape data mashups from SQL Server. Read more on Thursday to learn about this awesome feature. Besides these two big features we have several other new experiences available this week. Look around at the refreshed site and give us your feedback. Go here to let us know what you think. 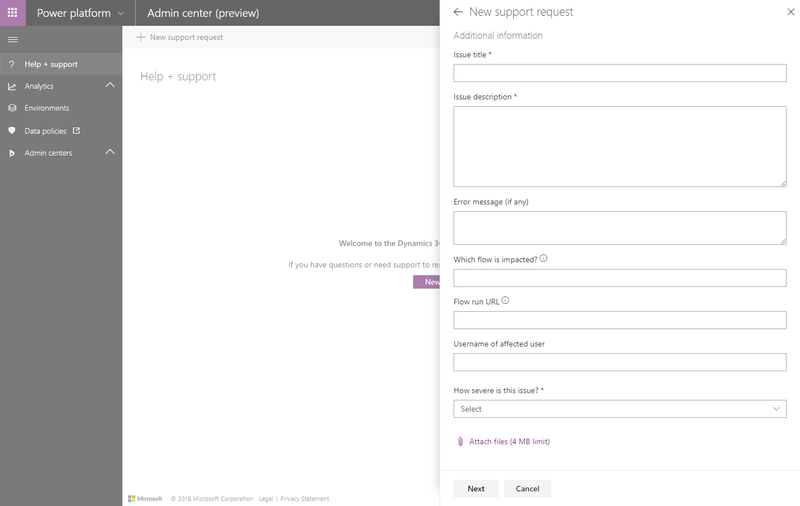 If you encounter issues when you’re building or running a flow, or encounter any other issue while using Microsoft Flow, your administrator can open a support ticket from the Power platform admin website (the same place that they can open tickets for Dynamics 365). Support tickets opened from the admin website can now contain additional details about your user account plan and the broken flow, where applicable. These details are sent to Microsoft support engineers to help them resolve issues more quickly than in the past. When there's a new message in a channel – This operation triggers when a new message is posted to a channel in a Team. When you are @mentioned in a channel – This operation triggers when a new message is added to a channel in a Team, that mentions the current user. This is another example of how we listen to your ideas on the Flow Ideas forum. Earlier this month we addressed the #1 idea – customizing who an approval comes "from" – and this feature is the #2 idea. Please keep voting on ideas on the community to help us know what to work on next! These actions also have a new option for handling if there is already a file or folder in the destination; you can choose from creating the file with a new name, failing the action, or replacing the existing file. 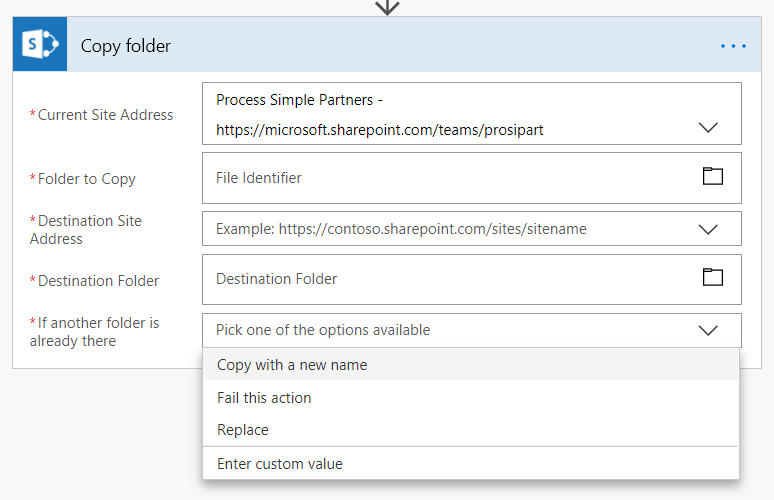 Second, there is now a new operation to Create a sharing link for a file or folder, just like we have for OneDrive and Azure Blobs. Finally, there are two more operations for getting additional data: Get all list and libraries, and Get folder metadata. AppsForOps – Apps to automate your business operations. Run a better business today. K2 Workflow – Use the K2 Workflow API service to remotely work with workflows and tasks. TeleSign SMS – TeleSign SMS enables apps to send global text messages. Add as another communications channel to send alerts, reminders, notifications, invites, marketing messages and more.